√√√Change your dog's bad habit of persistent barking in a simple, harmless and effective way. 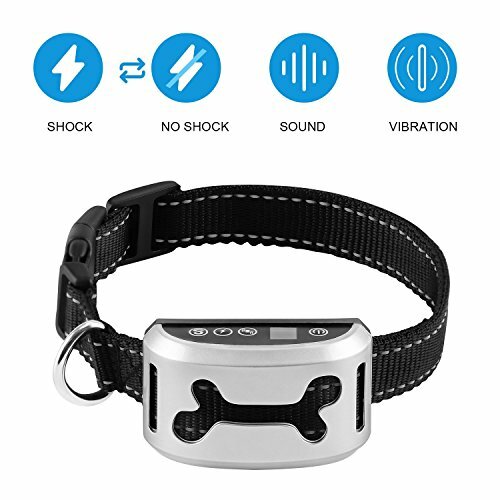 This smart no bark collar is your best choice! Ⅰ. Features 1. Three training modes: Beep, Vibration and Shock mode. Meet your various needs. 2. Seven adjustable sensitivity levels can be selected for your dog as needed. 3. The collar uses the latest vibration sensor technology which is safe and effective for training your dog. Only your dog’s barking combined with vibration will trigger the sensors. No false triggering. 4. Rechargeable battery can fully charge via USB cable within 1 hour supports up to 10 days of use. 5. Rainproof design is available for both indoor and outdoor use in different weather. 6. We recommend using this adjustable collar on dogs between 6 lbs and 150 lbs. Ⅱ . Specifications Item weight: 2.5 oz Collar Diameter: 1.18-7.08 inches Ⅲ . Package Contents 1 x No Bark Receiver 1 x Adjustable Nylon Collar 1 x USB Cable 1 x Test Bulb 1 x User Manual Ⅳ . Notice 1. Please DO NOT use this product to train dogs which has tendency of attack. 2. Use on healthy dogs ONLY. Dogs must be over 6.6 LBS or 6 months old. 3. Please take off the collar when dogs go swimming or take shower. 4. DO NOT be too tight to hold the dog. Let your pet run free once again! An advanced powder formula packed with natural high strength : Inulin (Prebiotic), L. Acidophilus, E. Faecium, B. Lactis, L. Rhamnosus, B. Breve, B. Animalis., . Order Now. It Hurts To Watch Them, Watching Other Dogs Play We stood helplessly watching Mollie run around, while Baxter just lay there with his chin on the ground. Every time his doggy brain said "Let's Go Play", his joints ached and he has no energy. He was in physical pain - but his face told a story of a deeper hurt ... He couldn't be a dog anymore. After trying countless failed remedies, we decided to research and create our own science-based formula for our beloved, and people like us. Today, Baxter's cheeky grin confirms the effort was worth it just to give him the best dog probiotics supplement, and the best time he could have while on earth. ... And now, Furry Pals is here to serve your 'Baxter' too. Are Baxter's Standards High Enough For Your Pet? 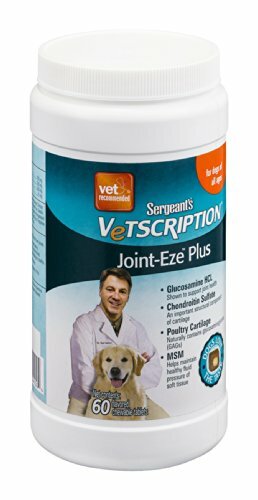 > Shellfish free, Natural, Vet Science Approved Ingredients Suitable for BOTH cats and dogs ORDER NOW - Risk Free Guarantee AND Save 10%! Our Gift To You And Your Pet Order two or more of our premium health dogs and cats formula and save 10% on your order. Allow 3-months continued use to replenish depleted stores. If, after that time you are unsatisfied - contact us for a no questions asked refund or replacement. Order Today.